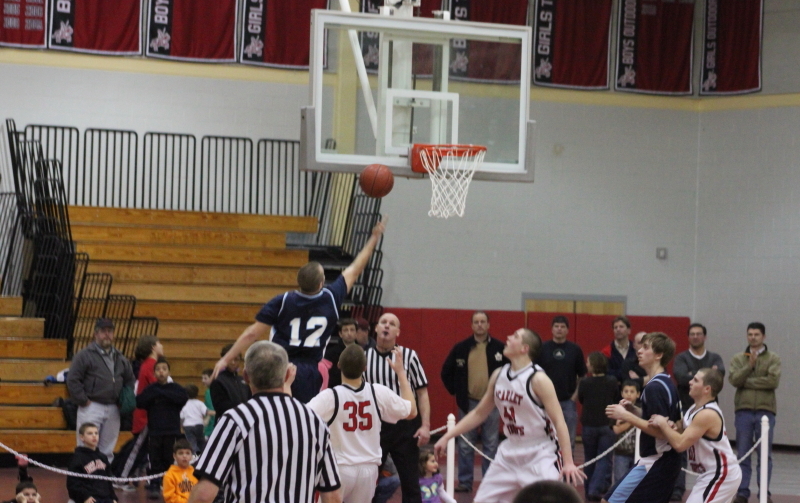 Nick Godzyk (#12) sails in for a layup with thirty seconds left. 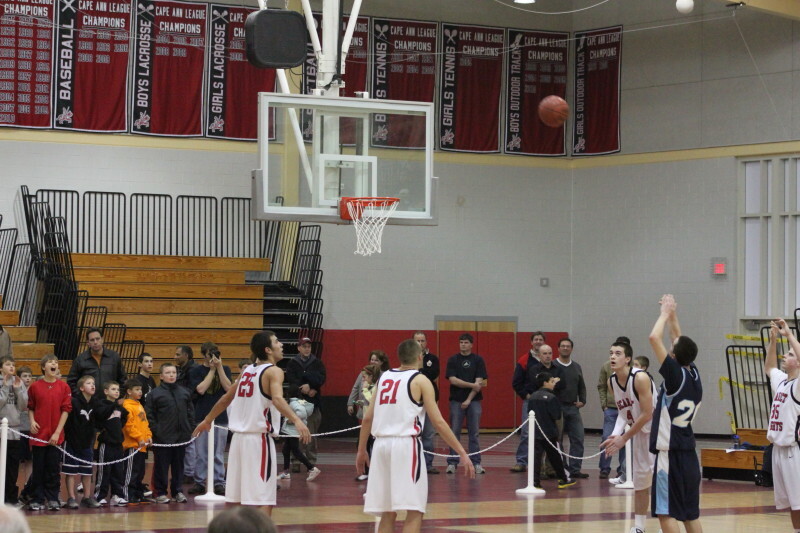 Tim McCarthy closes out North Andover with two free throws with ten seconds left. 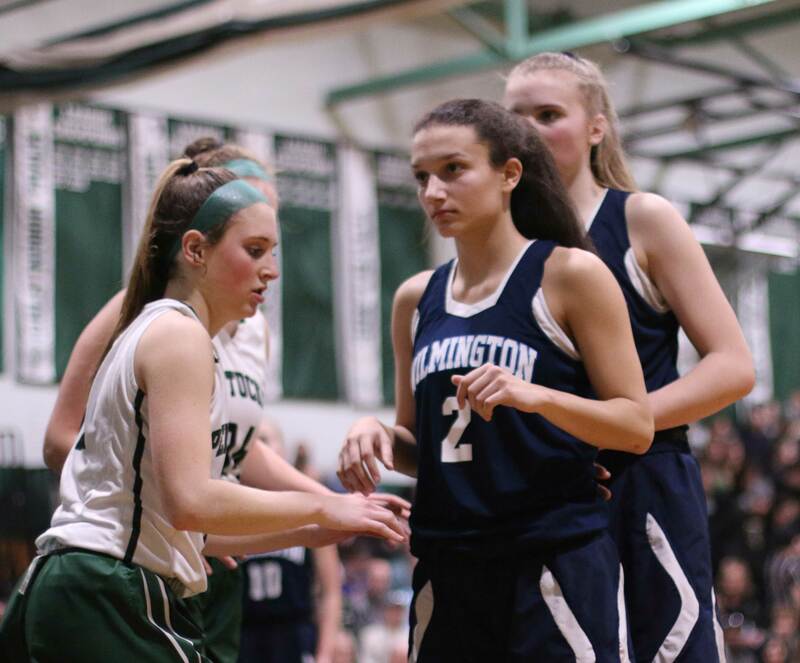 (North Andover) Wilmington took the lead with 5 ½ minutes left and never let go defeating North Andover, 62-56, before a Senior Day crowd on Friday night in Cape Ann League play. 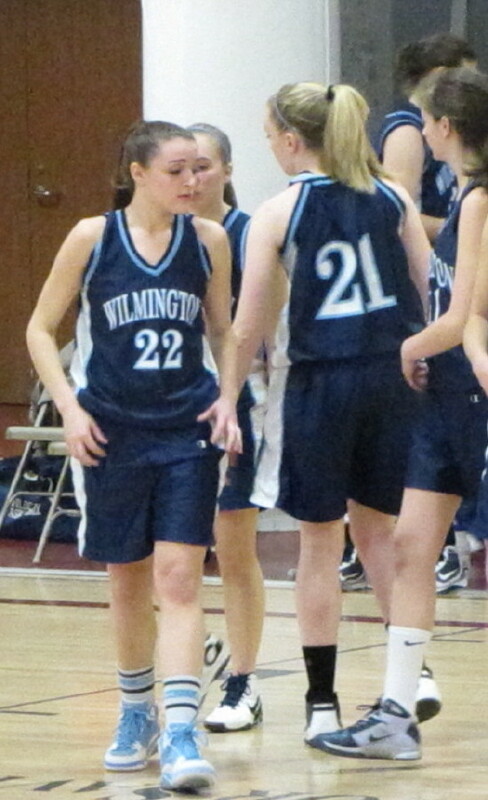 Wilmington (13-3) was coming off two straight losses, including the most recent to winless Ipswich. The Wildcats gave no early indication that could compete with the Knights getting just seven points in the first period on 1-for-16 shooting. 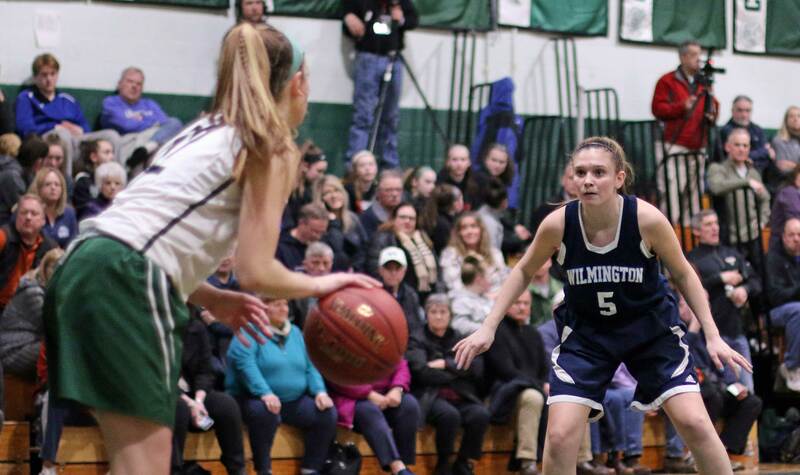 The rest of the way Wilmington shot over 50% (25-for-45), turning up open shots in transition as well as numerous layups after slashes to the basket. North Andover (14-3) had won the first match (62-58 at Wilmington) between these two and dominated early in front of a terrific high school crowd. The Knights built a lead of nine (23-14) in the first half and looked to be the better team with their size and early effectiveness close to the basket. 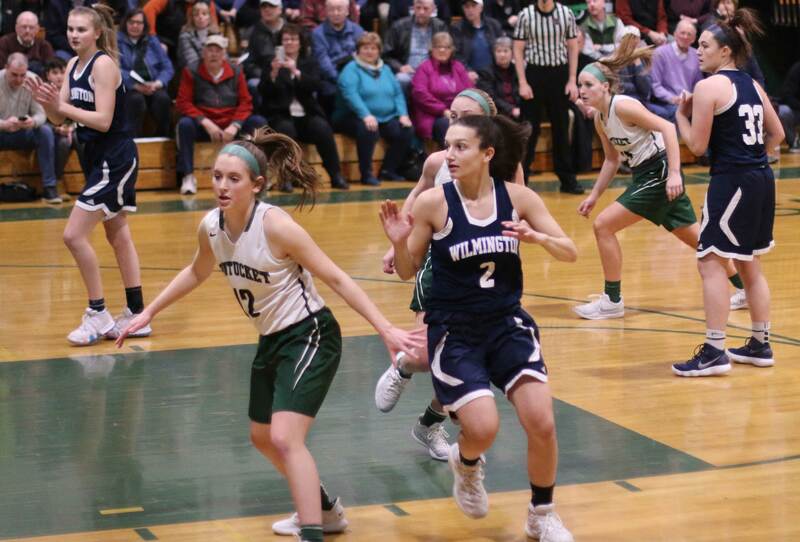 The Knights, however, missed their first eight shots in the second half and Wilmington took advantage pulling in front (32-29) for the first time, since an early 2-0 lead, thanks to five straight points from Vinny Scifo (20 points). Vinny pushed that lead to six (46-40) early in the last quarter on yet another slash to the basket. 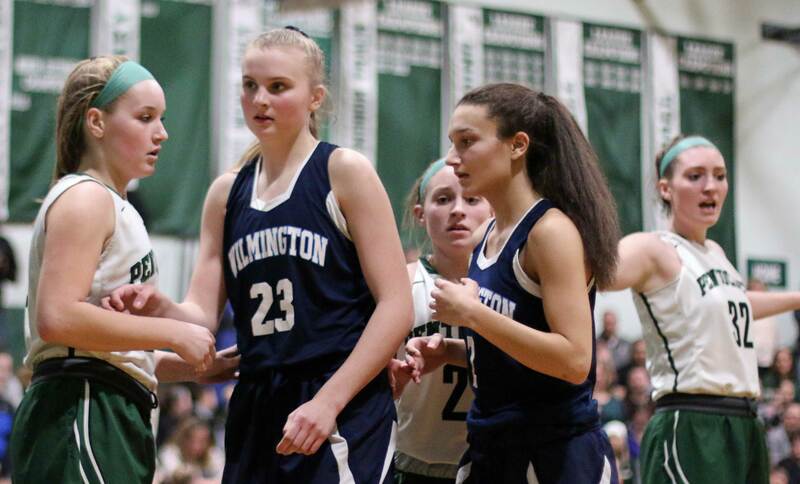 At this point, Wilmington looked to be on its way to a win. But the Knights came right back and regained the lead with seven straight points (a jumper by Derek Collins and a layup and a three from Zach Karalis). A layup by Wildcat Tim McCarthy (10 points) and a free throw from Knight Colby Smith tied the score at 48-48 and the stage was set for the final 5 ½ minutes. 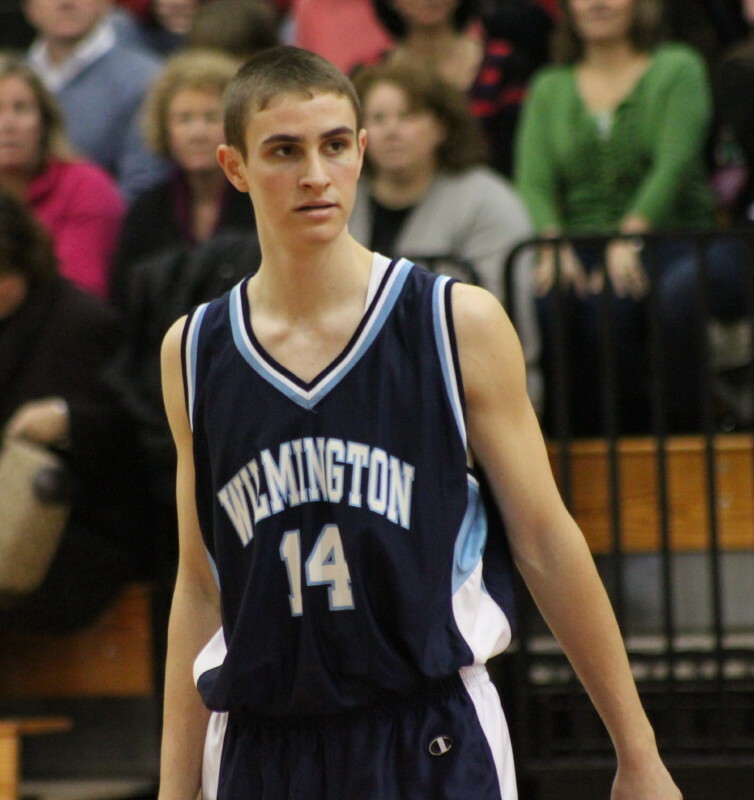 A driving layup by Vinny broke the tie and put Wilmington ahead by two and remarkably that lead held up. 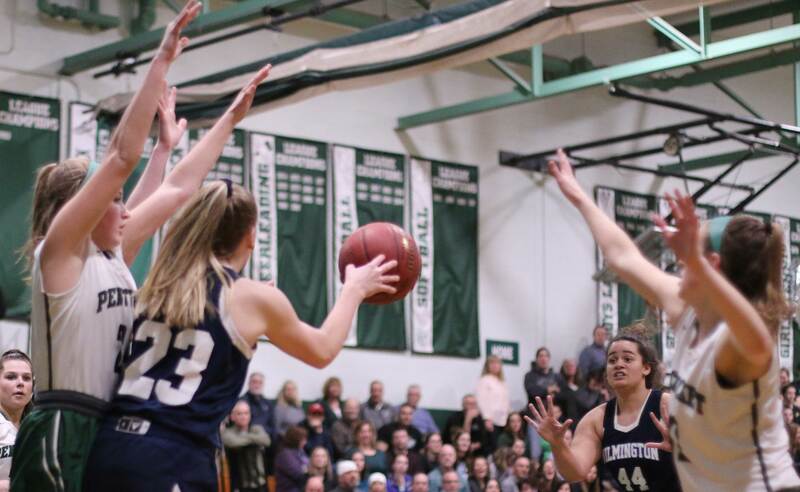 North Andover had four possessions in which they could have tied or regained the lead but came up empty missing a number of high percentage shots. 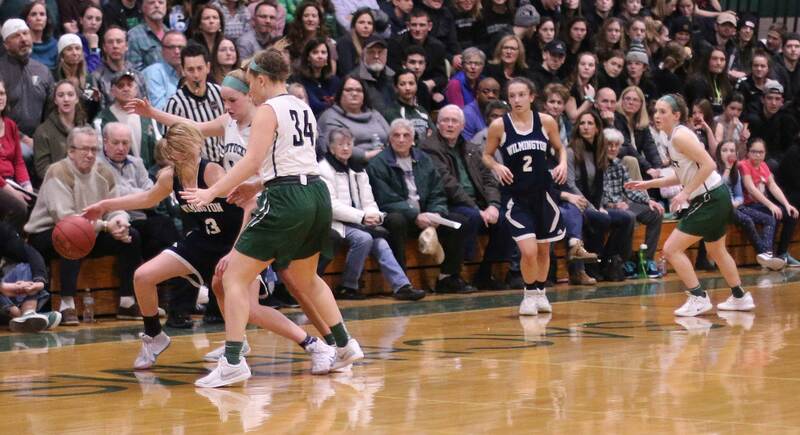 The winning basket turned out to be a jumper in the lane from Tim McCarthy with 1:23 left increasing Wilmington’s lead to, 58-53. 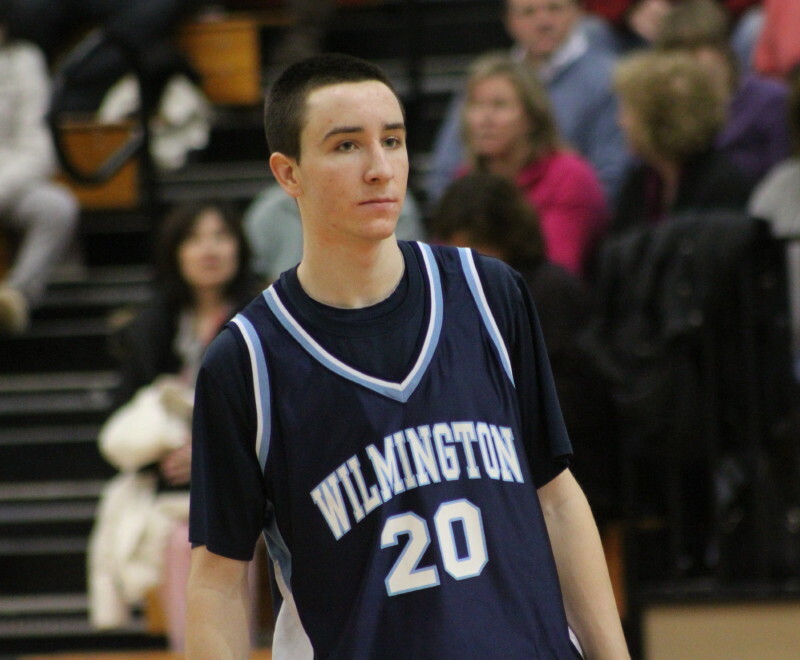 Next two possessions the Knights surrounded a Wilmington 5-second violation with three free throws but Nick Godzyk’s layup with thirty seconds left (pictured above) pushed the lead back to four (60-56). 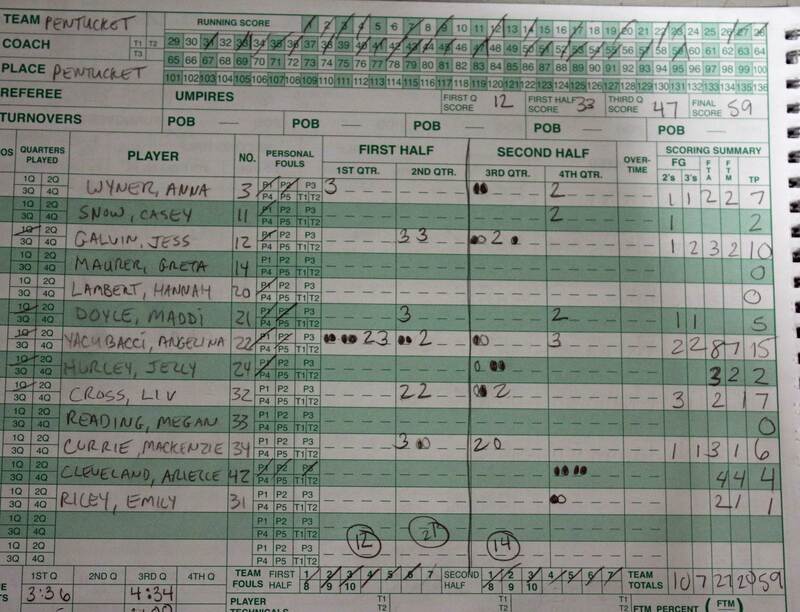 Isaiah Nelsen air-balled a three and Tim McCarthy added two free throws at the end to finish the scoring. 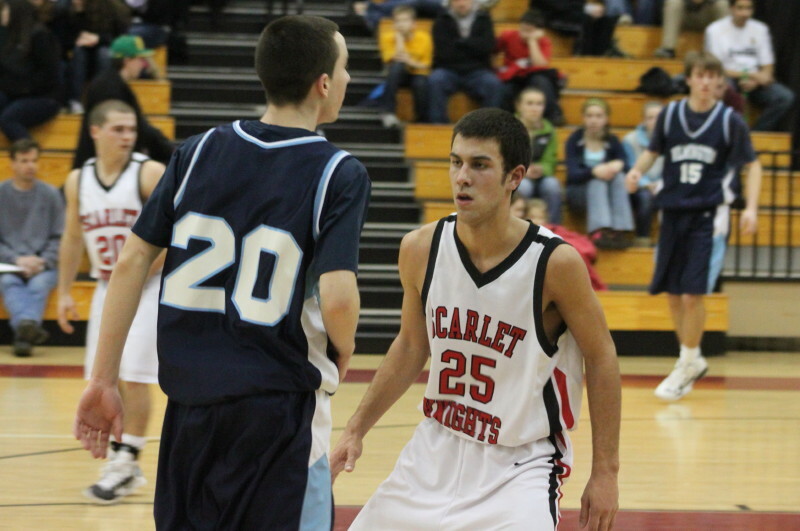 Zach Karalis, here defending Tim McCarthy, collected 22 points for the Knights. 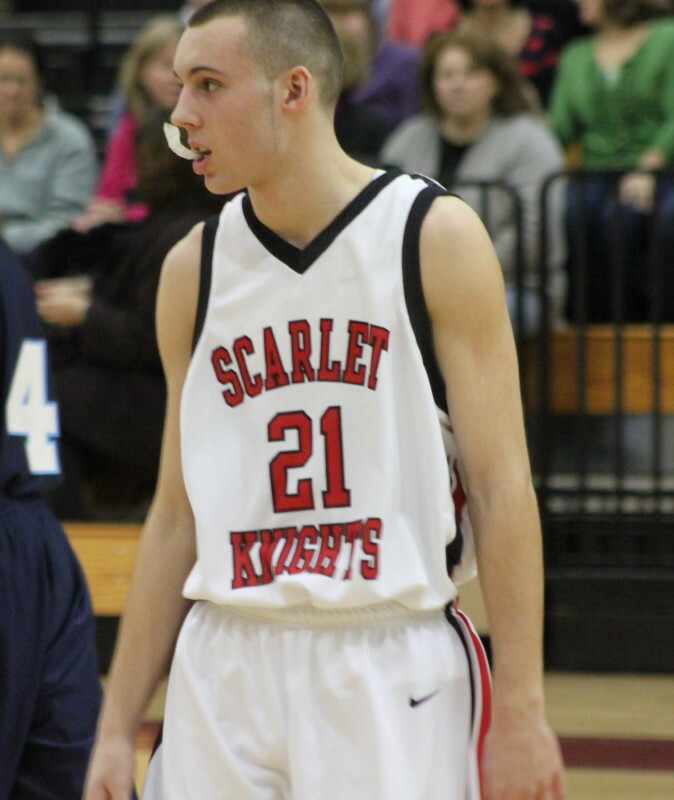 Zach Karalis (22 points) showed an assortment of shots and a willingness to set up other teammates. 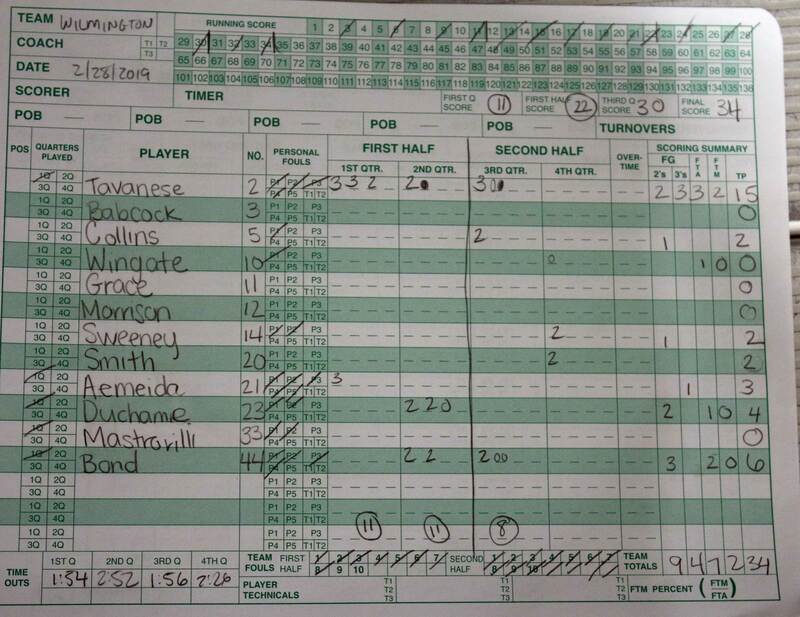 The Knights ran a number of two-player maneuvers but struggled to finish in crunch time. Vinny Scifo, Tim McCarthy, and Nick Godzyk put on a driving clinic. Vinny was so good at it that he was never fouled. Tim did get fouled and was 6-for-6 including two with ten seconds left. 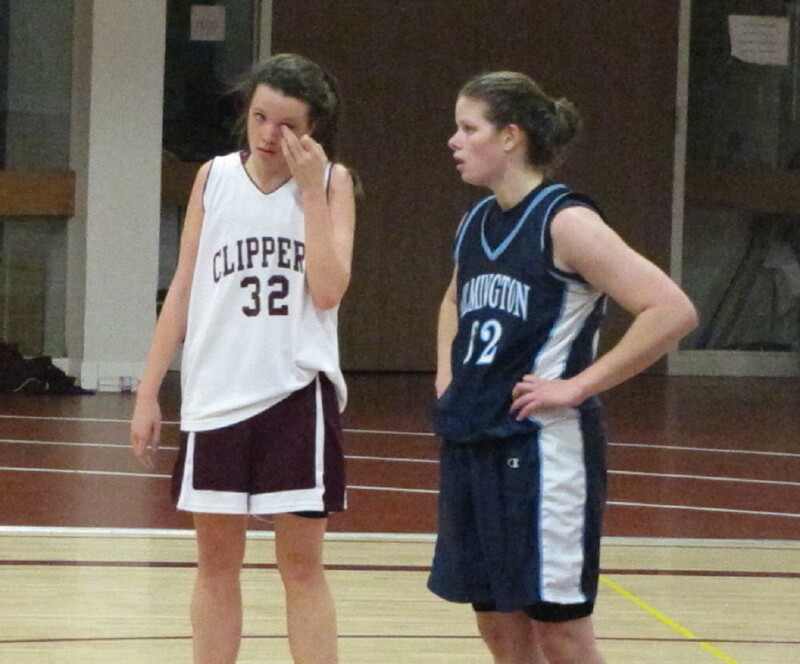 This was a matchup between two of the best teams in Division 2. Both of them have made the post-season already. They both looked capable of doing very well in the tournament. 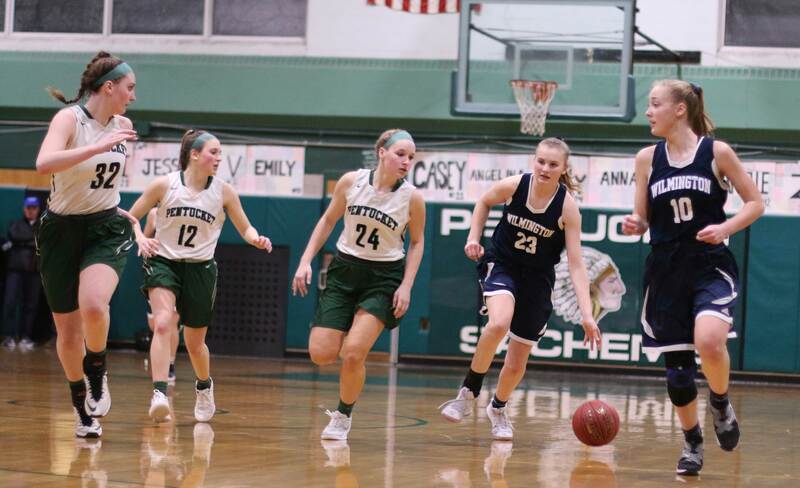 (Newburyport) The Wilmington Wildcats (6-4/9-6) scored the first seven points of the game and never trailed defeating cold-shooting Newburyport (5-5/8-9), 55-35, at NHS. The Clippers shot 25% in the first half (8-for-32) and you expected things to improve with the possibility of erasing the 30-21 halftime deficit. Didn’t happen……..in fact the shooting got much worse. How does 10.2% sound – (4-for-39)? 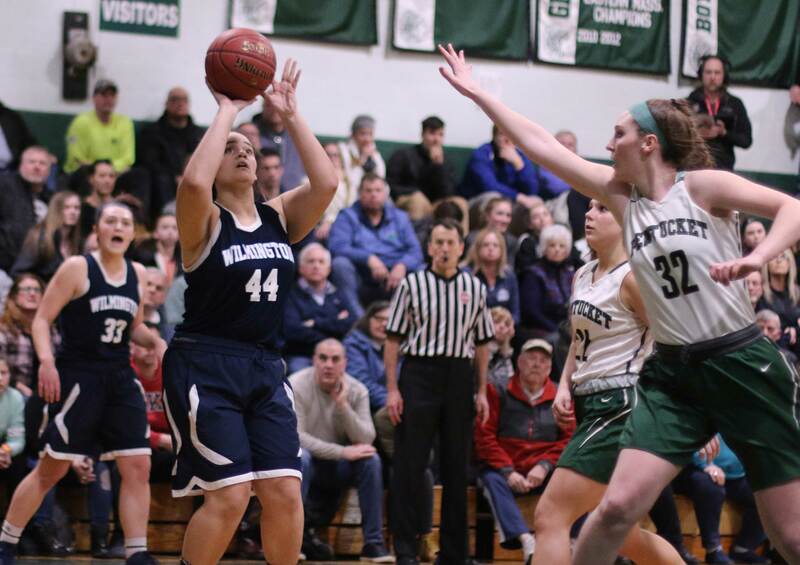 Maybe the Wilmington shot blockers led by sophomore Maggie Brown had something to do with the bad numbers but there were plenty of good-look medium range shots that just weren’t falling. There actually were very few 3’s attempted. 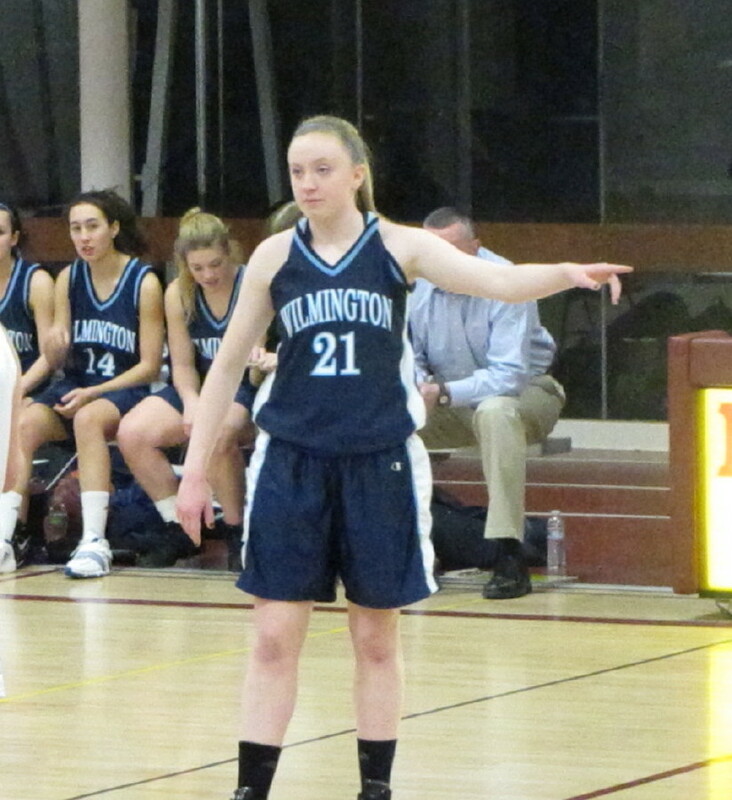 Wilmington shot 33 ½% for the game while missing a ton of in close shots as well. They got many of those good shots via well-run two-player maneuvers. 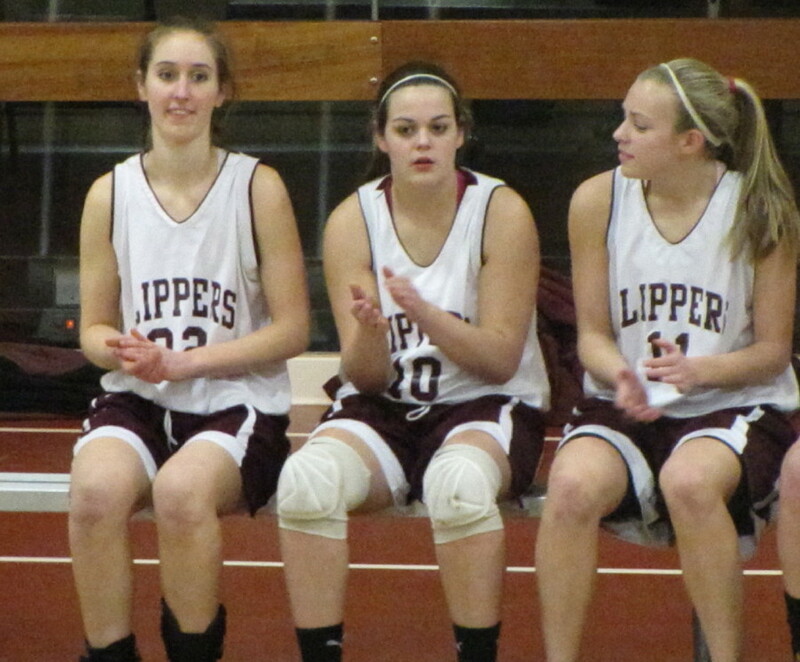 Sophomore Emily Crannell and Amy Fahey (12 points) executed several backdoor cuts that turned up layups for Amy. 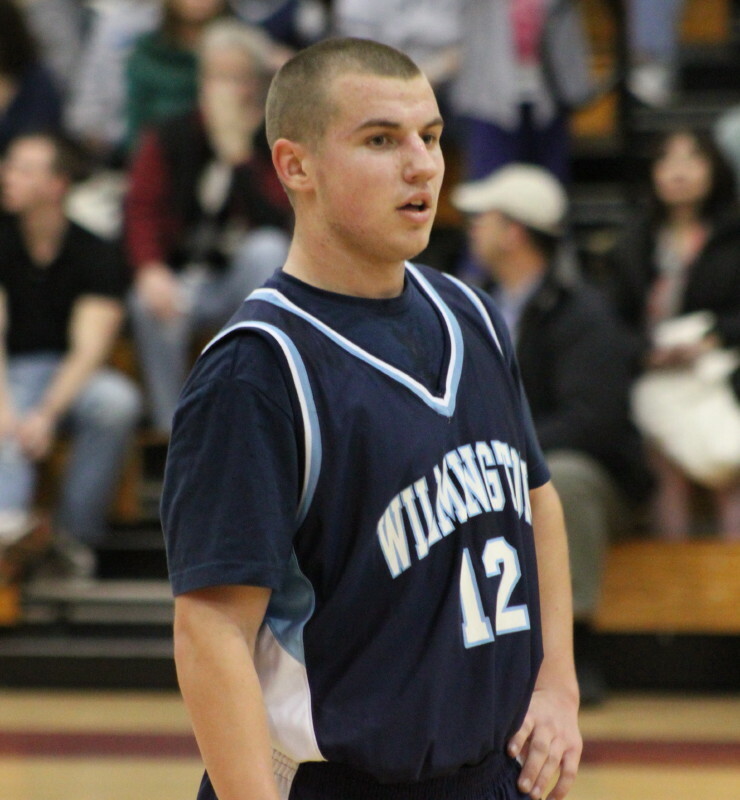 The WHS co-captain tallied ten points in the second half. 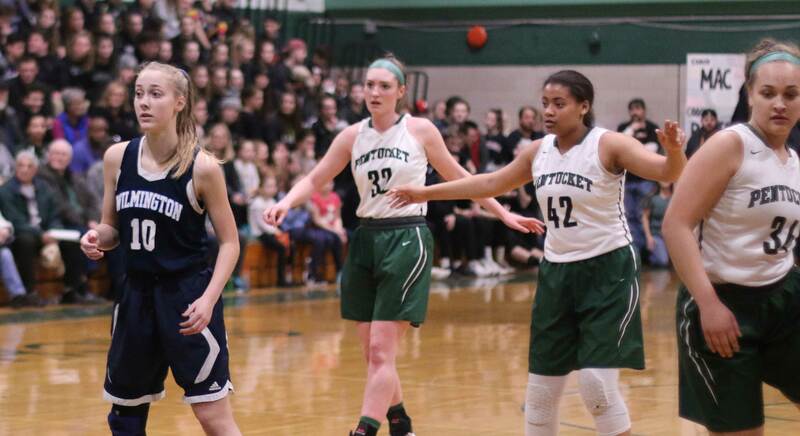 Junior Amanda Keane (daughter of the coach) and Maggie Brown displayed some fine moves to the basket but had trouble finishing, otherwise the final margin would have been even greater. They both play excellent defense. 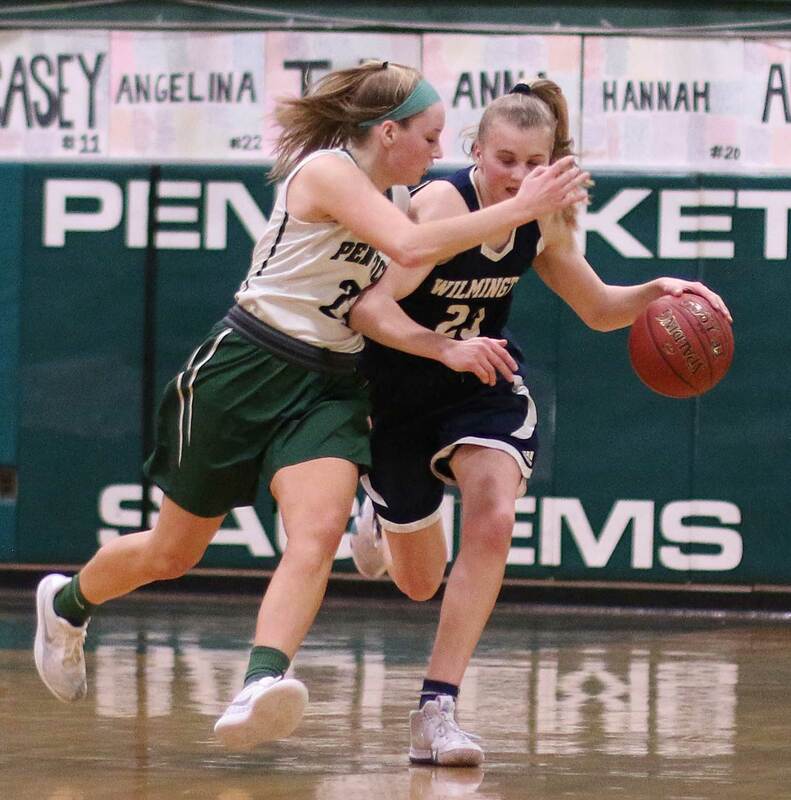 Amanda had Lindsey Tomasz early on but after senior Sam Baribeault (13 points) made some shots in the first half switched over to Sam. Thanks go to the basketball rules committee for deciding that the only actual jump ball would be at the start of the game. By my account, there were ELEVEN jump ball situations thereafter. A night of inaccurate shooting is one thing………. Both teams draw the short straw when it comes to their next opponent. 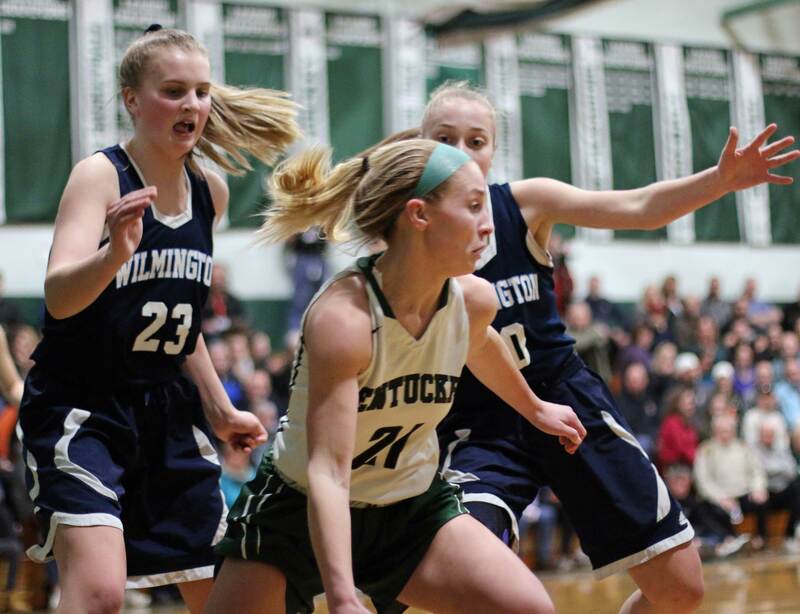 Wilmington gets Pentucket on Wednesday and Newburyport tries the same team on Friday. 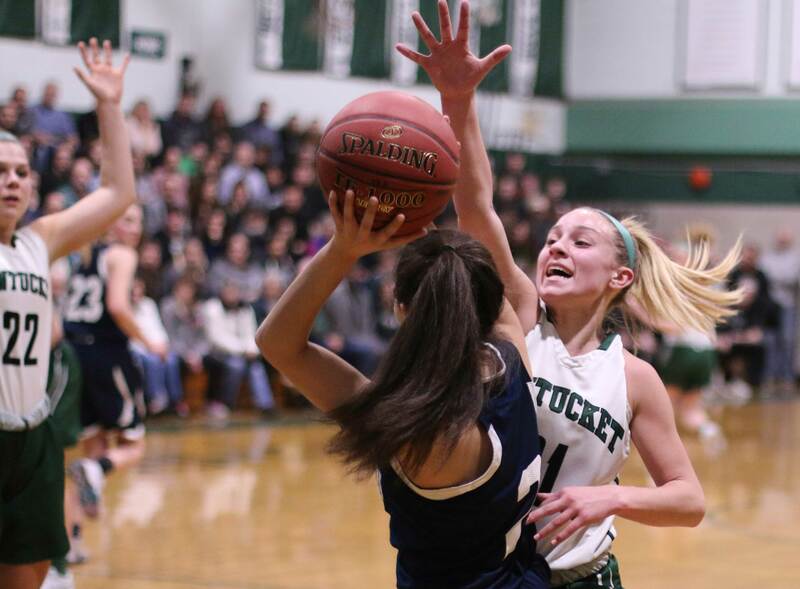 Good luck to anyone against Pentucket because they’ll need it. 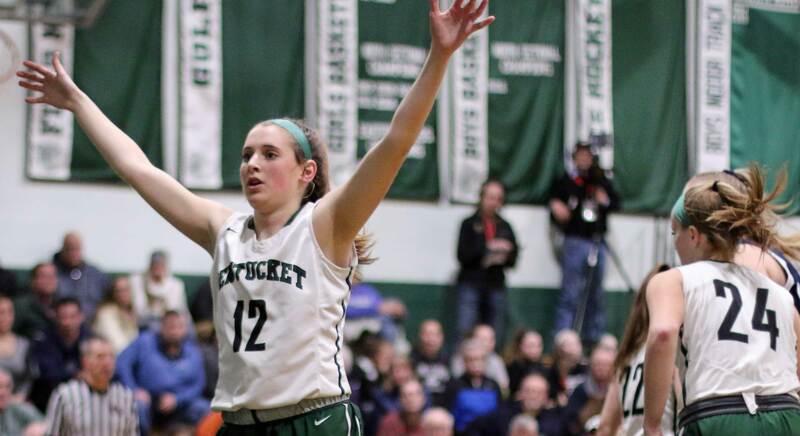 Undefeated so far, it’s a safe bet to project the Sachems to still be standing when the Division 3 North MIAA tournament ends.